The purported first glimpse of the LG G5 is a fine thing to look at! Fans of LG smartphones are in for a treat, as today may be the first time we catch a glimpse of a prototype LG G5, along with a purported spec sheet. Coming in courtesy of Reddit user mobile_leaks, the list drips with heavyweight hardware. Although everyone can put together something like that and throw it on the Internet nowadays, mr. Leaks really seems to be in on the good stuff. Apparently, he has a prototype unit inside a black case, which obscures the design to prevent leaks... how ironic! Let's go through the main points of interest, shall we? A full metal body is claimed, and shiny material is visible through the holes in the prototype casing. Mr. Leaks also claims that the phone probably has no removable battery, but there's still a microSD slot. "This is the device for people who want to upgrade from LG G2" - he remarked. Speaking of which, the LG G5 supposedly has a 5.3-inch display. Mind you, other leaks have described a 5.5-inch or 5.6-inch screen, so that's still up for discussion. A Snapdragon 820 chipset with 3GB of RAM is said to power the smartphone. This is one of the most solid rumors about the LG G5, and at this point, we can't picture anything other than Qualcomm's 2016 flagship processor running the mains. A dual camera setup is visible in the photo, described as two units — a 16MP one and an 8MP one. There's a laser autofocus module, and possibly a color spectrum sensor, although the latter isn't mentioned. The leakster speaks of a heart rate sensor, though. An 8-megapixel front camera is taking selfies. The leakster doesn't mention anything about the heavily rumored iris scanner developed by LG and Irience. 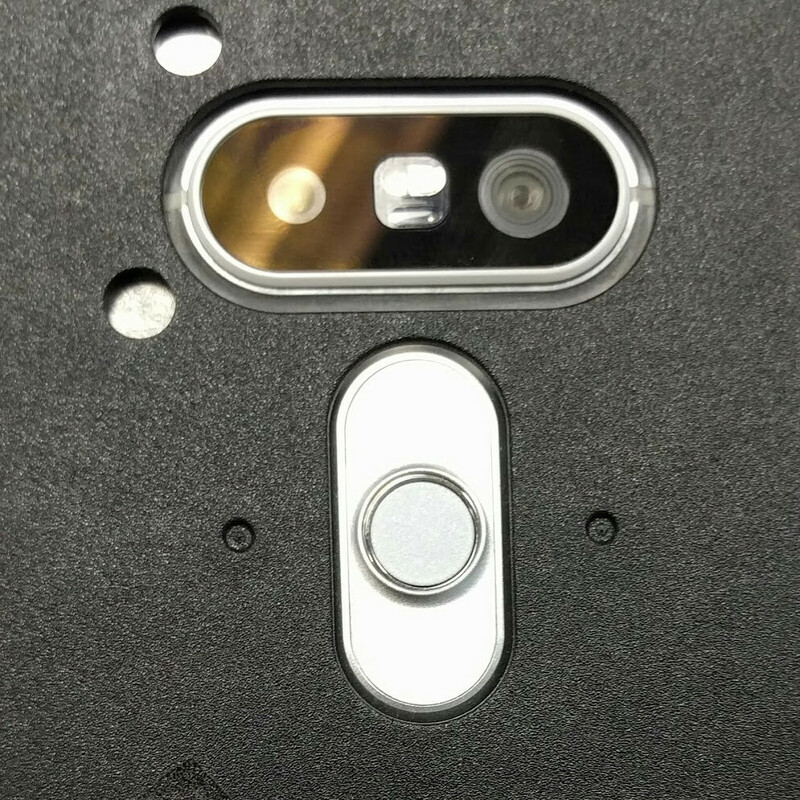 There is a fingerprint reader, however, built in the power key as in the LG V10. The LG UI no longer has an app drawer. Misc features, such as an IR blaster on top, a single speaker on the back, a USB-C port, and a "pressure sensor" are mentioned. It's not clear whether that's atmospheric pressure, or a pressure-sensitive screen. Whew, that was a fair bit to go through! This is an interesting leak for sure, and even if half of it turns out real, then LG will be taking its next flagship smartphone to some interesting places. By the way, don't miss out on our LG G5 rumor review if you want the most in-depth rumored information about the upcoming flagship. LG is stepping up their game year after year. Kudos to LG for that. NO REMOVABLE BATTERY = FAIL The removable battery is the ONLY reason I will buy LG over the S7. If not, I'll just keep my S5 indefinitely. They need to stick with a steel subframe and removable back. Equals a "fail" for *you*. You forgot to add that. The vast majority of the buying public couldn't care less about a removable battery. my co worker and just go the lg v10 and after trying it out today i still say hell no to the back buttons just stupid area even he hates it and he is coming from a m8 switching carriers. engineer, sorry you and your co-worker dislike the back buttons. To me they are more ergonomic than side buttons. They are positioned exactly where my fingers fall to hold the phone in my hand. Seems like a natural extension. Also I really like the totally clean sides. I can hold the phone horizontally, to watch a video, or take a picture, and there is zero chance that I will accidentally hit the on off button or volume accidentally. But truthfully, after 2 years with the G2 and 3 months now with the v10, the only times I ever touch the back buttons is to turn the phone completely off for a long flight once a month or so. I typically just wake or sleep the phone with the double tap and control volume with the screen slider. When I use someone elses non lg phone or pick up my samsung tablet i an stymied why the double tap wont wake the screen, I'm so used to it I'd hate to be without that touch control. I hope you and your co-worker can make some adjustment and perhaps come to appreciate it's virtues. I hope they can deliver a better camera this year, the LG G4 camera was hit and miss, some great shots but also so quite bad shots. It wasn't until you put them side by side with images from a number of different devices did it become apparent how bad some of them were, which is why it came last in a recent camera comparison on AA. Great potential but they need to work on the image quality a little more, the software side in terms of the manual mode is great though. Where are Qualcomm Sense ID ultrasonic fingerprint readers? It should be a part of S820... The best place for fingerprint reader is under screen. where the laser autofocus? that he looked different than the versions you transition. I thought IR was Infared Remote? Like it can be a universal remote... what does that have to do with auto focus? Or am I wrong with what IR is. I'm more interested in LG's new UI. Also are they also going the thin route at the expense of battery capacity, LG G2, G3, G4 all had 3000mah, so I'd expect nothing less. They should release 2 variants but same specs. One with 5.2" FHD screen with at least 3000mah battery. The other one in 5.5" or 5.7" QHD screen with at least 3500mah. I think they can just take care of that bigger one with the V10 2. You know you can use width and height to right? Buttons are right over the SoC where you don't want a battery since that area is so hot. There is a phone for those who want to upgrade from the G2, it's called the Nexus 5X. I don't want a smaller screen. When you get a big screen you don't want to go back. 5x is not even a proper replacement of nexus 5. Check anandtech review, SD 808 performs worse than 800 in any real world workload longer than 2 minutes. Also the battery is not near the G2. If I want to upgrade my phone after 2 years, I need some upgrades; not almost the same phone with tiny upgrades and a newer release date. The only thing 5x does better than g2 is probably camera, and even in that it loses on OIS. More sensible upgrades would be s6 or z5, since they are real flagships. 5x is just a midranger. Wrong, because someone who values the G2 features will want expandable memory and removable battery. G2 has neither of those. Except Korean version. No app drawer?? Recently leaked HTC X9 pics shows HTC's new UI has no app drawer too. Why other OEMs are following Apple and other chinese OEMs(copycat of Apple)?? App drawer is one of the advantages of Android over iOS. It's a deal breaker for me. I know, right!? It's so stupid to do this. Luckily, I can just use Nova Launcher which is way better than any stock UI. Just slap a launcher. It takes 30 seconds to do and nova works way better than any launcher. This makes me glad I got the V10. I consider a sealed aluminum body a downgrade from the premium durability of the duraskin and stainless steel build of the v10. Saddest news is the sealing of the battery. I too was a g2 lover but battery life, once awesome when the g2 was new, dwindled each month to less than 2 hrs screen on time when I had to bid goodbye to it. i HOPE NEVER TO FALL FOR THE SEALED BATTERY TRAP AGAIN. Battery in G2 really simple to change. It's also part of full warranty since it's part of the phone and not an accessory like loose batteries are. Just not a fan of the volume buttons on the back; I'd prefer to wake my phone from lying on its back. I'd imagine if most consumers enjoyed the rear placement of the buttons, more OEMs would consider moving their buttons to the rear as well. Simple answer to your concern. If the phone is lying on it's back, just double tap the screen to wake. Could not be more convenient. The phone doesn't sit flush, however. Also, I'd like a fingerprint scanner incorporated and I'd imagine that'd be on the back as well. I tried the LG G4 and I loved the way it felt in hand but I couldn't get past the software and the button placement. I upgraded my G2 to the G4, love both phones, but even though the G2 had good battery life I prefer the G4 because of the removable battery. There needs to be significant improvement in the battery life on these phones, if they can't do that then they need to keep the removable battery. If not then the top priority for my next phone will be the flagship phone that has the best battery life regardless of who makes it, otherwise I guess I will hold on to the G4 for another year.